Turkish President Recep Tayyip Erdogan celebrated a sweeping re-election victory after a hard-fought campaign that proved to be his most challenging political battle after almost 15 years in power. Mr Erdogan was declared Turkey's president by electoral board chairman Sadi Guven, who said he won a majority based on 99.9 percent of counted votes. The election commission later confirmed Erdogan the victor, and also said Erdogan's Justice and development Party (AKP) and its allied Nationalist Movement Party (MHP) had retained their parliamentary majority. Mr Erdogan's main rival, Muharrem Ince of the Republican People's Party (CHP), conceded defeat but branded the elections "unjust" and said the presidential system that now takes effect was "very dangerous" because it would lead to one-man rule. State media also reported on Sunday that Erdogan's AK Party holds 43 percent, while the opposition party holds 23 percent of the vote, with 96 percent of the total vote counted. But a better-than-expected performance by its nationalist ally, the Nationalist Movement Party (MHP), should allow the party to control the legislature, expanded from 550 to 600 seats. "With the presidential system, Turkey is seriously raising the bar, rising above the level of contemporary civilizations". A headline by British magazine The Economist reading "Turkish people should show Erdogan the door" was also slammed by some Erdogan supporters. The president's critics, including the European Union which Turkey still nominally aspires to join, say Erdogan has used the crackdown to stifle dissent. But for the first time, he faced a formidable challenger in Ince, whose charisma and sharp criticism of the president gave him wide appeal. He managed to pull support from all sections of society to his large rallies with an election slogan of "we will make peace, we will grow and we will share". Erdogan had called surprise snap elections in April, 19 months ahead of schedule, in a move that analysts said was meant to catch the opposition off guard. The election council will announce final results on Friday. The outcome of this election once again demonstrates that Erdogan's strategy of polarizing the electorate works. They have said election law changes and fraud allegations in the 2017 referendum raise fears about the vote's fairness. REUTERS/Umit Bektas People take photographs as Turkish President Tayyip Erdogan (not pictured) addresses a speech at the AKP headquarters in Ankara, Turkey June 25, 2018. Since a 2016 coup attempt, Erdogan has consolidated power, jailed opponents and clamped down on journalists. According to Israeli newspaper Haaretz, Erdogan and his AKP party "used state resources to ensure victory" adding that "the media is nearly totally pro-Erdogan after years of co-option and censorship". Meanwhile the greatest asset of the pro-Kurdish HDP, Demirtas, is hidden from view behind bars on charges he alleges were trumped up by Erdogan. In August 2016, Turkey conducted a military operation, Operation Euphrates Shield, in northern Syria to clear out Daesh and PKK terrorists from its borders. "Turkey", he said, "is staging a democratic revolution". "How can I vote for Erdogan?" The restrictive legal framework and powers granted under the ongoing state of emergency restricted the freedoms of assembly and expression, including in the media, said the observers. His CHP party led the coalition to challenge Erdogan. "If Erdogan wins, your phones will continue to be listened to". There are obvious limits to such comparisons, as here the press remains free, courts are independent, and Congress retains authority. While his supporters never thought a second round presidential vote would be anything but a foregone conclusion, they hoped Ince could capture enough of the vote to force one to happen - or even win the first round. Western leaders also confront hard choices in their relationships with Turkey. He also denied the claims that he was threatened and urged Erdogan to become the president for all and stated that he thinks Turkey wouldn't be "divided". Now, the country has roads, bridges, airports and hospitals. "We will go after terror organizations with stronger determination". 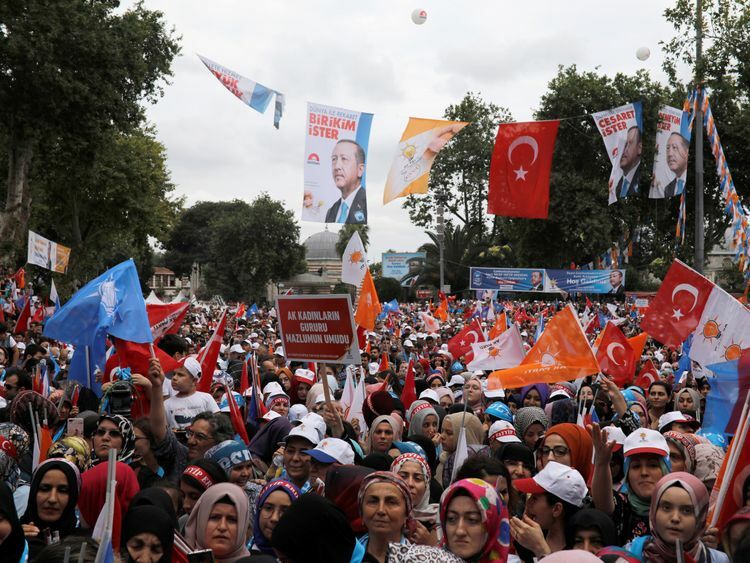 "Erdogan's emotional bond with his voters proved intact", said Ozgur Unluhisarcikli, the Ankara office director of the German Marshall Fund of the US. The Turkish lira has tanked and inflation stands at about 11%, though the economy has grown substantially in recent years. Neutvoom says that a lot of investors "don't agree with his position on the central bank". "The country is falling apart, we are in debt, there is a currency crisis", she said. Few newspapers or other media openly criticize the government, and he has received far more election coverage than other presidential candidates. Xhaka, Shaqiri and Lichtsteiner would likely have been shown a yellow card at the time for their celebrations. Meanwhile, Stephan Lichtsteiner has become the third Swiss player to be investigated over a goal celebration.